DJI Phantom 4 is releasing. Your Thoughts? Hi guys, you might already know that DJI Phantom 4 is releasing soon. What is your thoughts on this one? Do you think it will be worth buying immediately or should we wait for at least 6 months like Phantom 3? We are ofcourse looking forward to seeing the new phantom 4 but as far as all the rumors are going I dont think there is a massive motivation to wait. Given the current price of the DJI Phantom 3 line and all the roumours suggest the Phantom 4 will be in excess of £1300 I think for consumer level drone pilots the phantom 3 is still a great option and none of the new features relay stand out. 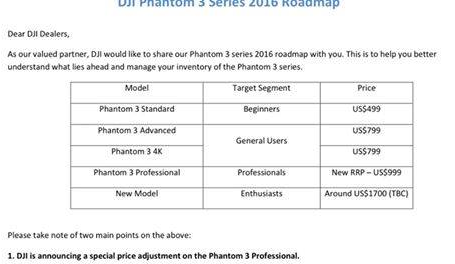 A recently leaked email (and we can confirm) that DJI are still planning to market and sell the phantom 3 series with new lower pricing throughout 2016. And the table also suggests a new model at around the $1700 price point… But it would also suggest that the new phantom might not actualy be called the phantom 4, but maybe just a new model in the phantom 3 series? DJI recently filed a patent titled Systems and Methods for Target Tracking, which goes on to hint that the new phantom will be able to track people automatically. This is definitely a great feature which we hope to see in all future DJI products as keeping the subject in frame automatically will make life much easier when it comes to filming. But hobbyists and professional drone pilots will find this a major reason to upgrade assuming it works well. 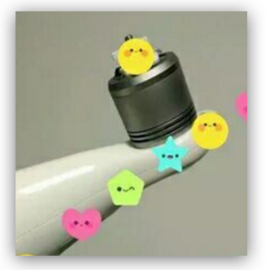 Leaked photos of the phantom 4 battery showing that it is much larger than current phantom 3 batteries. So one obvious conclusion is that it will have longer flight times something that is great, but it will also mean replacement batteries cost more. I konw that DJI do believe to make a large portion of thier money on the consumables such as batteries (hence why DJI introduced smart batteries with the phantom 2 so that you cant use 3rd party batteries with them) so it will be interesting to see if these will be more expensive to replace. But at the end of the day, if you can fly for more than 30 minutes in a flight that would great. For me one of the next breakthrough technologies with drones is the ability to avoid obstacles. I know that the Yuneec Typhoon H was shown to avoid obstacles at CES 2016. So I am certain that DJI will also realse a drone with obstacle avoidance. And leaked photos of the new phantom 4 do show some ultrasonic sensors around the drone including what look like cameras… but the resolution is too low to know for sure. The above photos also show what looks like a revised gimbal design which would obviously suggest better levels of stabilization which is great. The other roumor is that it will have 6K video. And in my opinion this is not something that excites me too much. For starters, only professional, or enthusiast realy care about 6K video as the vast majority of drone users probably dont even have 6K monitors or TV’s to watch the 6K footage. The 6K does suggest the image sensor is improved, but with most things its not about the megapixels, but rather the actual image sensor so it will be great to see an improvement here, but that said I am totally happy with the quality of the phantom 3 advanced camera. I would prefer to see something like Yuneec have done with retractable landing gear and a 360 degree gimbal. 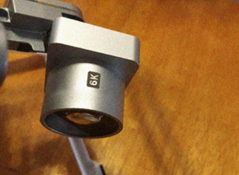 However I am pretty sure that DJI will limit this to their inspire 1, or inspire 2 drones for professionals. If you are looking for a drone that is more future proof then I can highly suggest you consider the 3DR solo, it uses a gopro as the camera so its easy to update as gopro release better cameras, and its also backed by 3DR warranty that if it crashes due to hardware fault they will replace the drone for free. 3Dr are also going to be releasing a range of addons for the solo in 2016. I’m excited that the technology is becoming available, I’m most interested in flying autonomous drones so object/motion tracking is an extremely important development. Not sure if i’ll buy one personally tho, qualcomm’s snapdragon flight controller thing is coming out in 2016 i may save up for that one. Yeah, its a great all in one package but if you like to tinker something like the snapdragon autopilot will be pretty cool. I also know we will be getting the new autopilot 3DR are releasing later this year which should bring the DIY drone builder hobby to the next level.